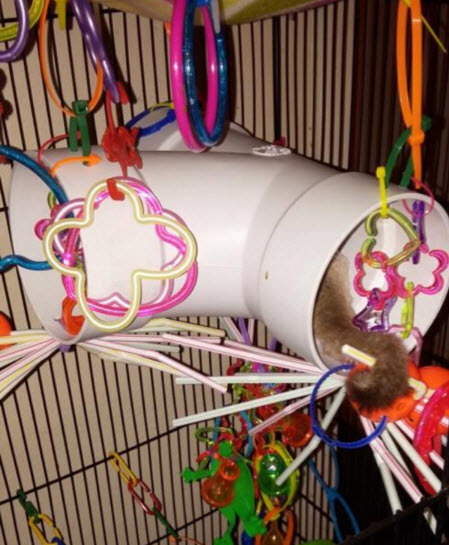 Turn a PVC pipe into a hanging tunnel in your sugar glider’s cage! Get a multi-way PVC connector pipe that is large enough for your sugar glider to fit inside of comfortably. Drill sets of two holes at several locations on the top of the pipe and on the bottom near the tunnel doorways. Thread a zip tie through each set of holes on the top of the pipe and fasten each zip tie to make a loop, then use more zip tie loops to make chains to hang the toy from the top of your pet’s cage. Thread a zip tie through each set of holes on the bottom of the pipe and fasten a bundle of straws in each zip tie. Thread various toys onto the straws for your sugar glider.